For up-to-date patch, package, and USN links, please click here. Today Intel announced a new side channel vulnerability known as L1 Terminal Fault. Raoul Strackx, Jo Van Bulck, Marina Minkin, Ofir Weisse, Daniel Genkin, Baris Kasikci, Frank Piessens, Mark Silberstein, Thomas F. Wenisch, Yuval Yarom, and researchers from Intel discovered that memory present in the L1 data cache of an Intel CPU core may be exposed to a malicious process that’s executing on the CPU core. Processors from other vendors are not known to be affected by L1TF. 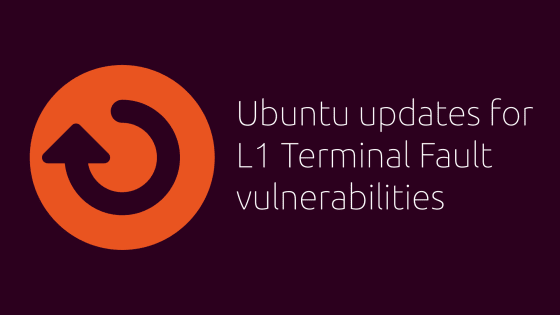 For technical details regarding this issue, please refer to the L1TF KnowledgeBase article, the Linux kernel documentation, and the L1TF Mitigation guidance published by Intel. Hardware OEMs are releasing BIOS updates containing the updated Intel microcode. Check with your OEM’s website to see if a BIOS update is available for your machine. Ubuntu updates for the intel-microcode package are also being made available. Microcode updates are not required for this issue due to a software fallback mode present in the Ubuntu kernel updates. Optimised kernels based on any of the above series were also released, including linux-aws, linux-azure, linux-gcp, and hardware enablement kernels. Updated cloud images have also been built and published to ensure a consistent Ubuntu experience. file. You must apply kernel updates and reboot if the file does not exist as that indicates that your kernel does not have mitigations in place for L1TF. We recommend that you apply available updates at your earliest convenience. We encourage Ubuntu users who seek more information to contact an Ubuntu Advantage support representative for an in-depth discussion relative to your use cases.